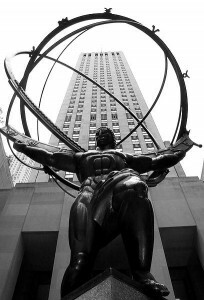 Atlas sculpture, New York City, by sculptor Lee Lawrie. Ayn Rand (1905-1982), Russian-born novelist and philosopher, is the poster lady for the modern-day Libertarian movement, and is admired by many freedom-loving conservatives and patriots. She was the founder of a philosophy called Objectivism and promoted Egoistic Hedonism (the belief that seeking your own selfish interests is a noble good and that greed is the foundation of all laissez faire Capitalism). Objectivism embraces an Epistemology (how we know what we know) of Rationalism (that we can know truth simply from our own minds and senses rather than from Divine Revelation). To see a rebuttal of this Epistemology theory, please read my essays: Reason vs. Revelation, The Limits of Human Reason, and Reason vs. Experience. If you remove all (or nearly all) external government, which Anarchists would prefer, then with what do you restrain society? I would argue that the Christian doctrine of Individual Self-Government (that each person is to be guided by the law of God restraining him in his own heart) gives the only hope for a truly free society. The secular Libertarian has no truly objective standard for morality and human behavior (despite their claims). Objectivism begins with a utopian view of human nature that is contrary to God’s word. The Bible teaches that humans apart from God will drift towards sins against themselves and their fellowman (Jeremiah 17:9). People will not get better and better apart from God, they will denigrate into chaos and ruin. Thank you Mr. Colson. I totally agree about Ayn Rand! Thank you for bringing what seems like would be obvious common sense to this ridiculous, shallow, and simple minded philosophy.! I am a Christian. Not identifying with any “liberal” or “conservative” but more liberal in some ways.